So far, I’ve seen American Hustle, Captain Phillips and the Wolf of Wall Street. I’ll do my best to see Gravity, Dallas Buyers Club, Her and 12 Years a Slave. Not sure about the rest. I’m also interested in seeing some of the movies that have actors/actresses nominated but not Best Picture, specifically Blue Jasmine (Cate Blanchett) and August: Osage County (Meryl Streep, Julia Roberts). I’ll post my picks once I’ve had a chance to see more of the movies with nominations. I’ll say it now – I think Seth did a good job hosting. It’s the toughest gig in Hollywood and everyone should give the guy a break… There are children starving and people dying of illnesses in the world – do we really have to spend so much time complaining about how funny, or not funny, the host was. Puh-leaze. Ok, moving on. SOOOO happy that Jennifer Lawrence won best actress although I was secretly pulling for Jessica Chastain. I watched The Help over the weekend and realized that Jessica played Celia Afoot (the blonde outcast) in it – she is amazing. But so was Jennifer Lawrence, so I was happy with the outcome there. Also super happy that Christoph Waltz won – he did a fabulous job in Django Unchained. Well-deserved win. Ecstatic that Ang Lee won the Directing award over Spielberg. Lee created a completely different world with Life of Pi. We all knew Anne would win for Les Mis. Been there, done that. I was happy that Argo won and thought Seth’s joke was hilarious about the story of Argo being so top-secret and unclassified that the academy didn’t even know who the director was. Ha – touché. I thought Adele did a fantastic job singing Skyfall – yay she won Best Original Song! Glad that Life of Pi won for Original Score – the composer is a fellow Canadian so I was somewhat biased but the music in the film was truly magical. Kudos. Same deal for Visual Effects – there was no way Life of PI wasn’t winning that one too. I’ve been pretty lax about watching all the nominated films but plan to buckle down and catch up before the big event. That’s February 24th by the way. The pros are saying Lincoln will be winning a bunch and it very likely will. But others like Silver Linings Playbook and Argo have garnered lots of buzz as well. Anyhow – if you;re like me and like to pick your own predictions, there’s a nice printable ballot posted here. 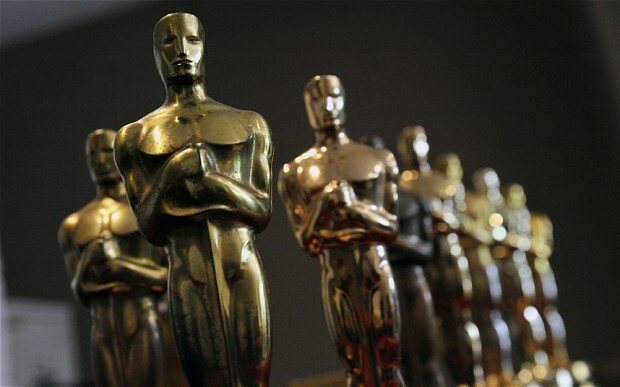 On the left-hand side of the page under the Facebook login, click on “Ballot.” There’s a printable PDF listing all 24 Oscar categories and all the nominees – after printing, you can tick your picks. Looking to play Oscar Bingo? It’s a great game if you’re hosting an Oscar party. You can get the 2012 ones posted by How About Orange. Or sign up to be notified once they post the 2013 ones. I’ll share my picks once I’ve seen more of the nominees – stay tuned! I realized that I had forgotten to share how I did with my Oscar predictions with you all. I did pretty good, got 17 out of 24 correct. Some were guesses (all the documentary ones and shorts). But all in all, I’m happy with who won. With all the hype around this movie, even though I didn’t see it, it seemed like a shoe in for best picture. Whoever directs the best picture winner usually wins. I thought I’d give George a shot, but looking back, it makes sense that Jean won. So glad that she won and she gave a great performance in the Iron Lady – so deserving. Seemed like shoe-in – and no surprise he won. Again, she was pretty much a sure thing. Glad she won. I loved the novelty and originality of this story – glad it won. It was truly a great story with its humanity and authenticity – well-deserved. This was actually a guess. I saw the film, enjoyed the creativity and could appreciate what it did for film. Wasn’t really a big fan though. This was a guess – any of them could have taken it. I guessed wrong. I thought the Artist would win here but was glad Dragon Tattoo got it. There was a lot of hype surrounding this film so my guess was based solely on the hype. I figured in a silent film where the music is a major piece, this made sense. I wavered between these two for a while before selecting HP as my choice. Shoulda went the other way! I thought Apes would win this for sure but Hugo really swept the technical categories. As of this weekend, I have seen 6 of the 9. The last 3 I need to watch are The Artist, Extremely Loud & incredibly Close and The Tree of Life. So far, my thoughts on the chosen nominees are varied. War Horse is a great film that tells the story of a horse as he moves from owner to owner from birth and throughout the war. Although it was a great story and interesting film, I couldn’t help but make comparisons between the last great horse film (Secretariat) and found that War Horse was lacking a certain element of excitement. That being said, Joey (the horse in War Horse) wasn’t a race horse and I’m probably making an unfair comparison. It was still a very good film and I understand why it was nominated. The Descendants is a very human film – it’s the story of a father and husband (George Clooney) whose wife is in a coma after suffering a terrible boating accident. As truths come out, the father and his eldest teenage daughter embark on a mission to get to the bottom of things. Great characters, relationships and storytelling. It’s a subdued film but entirely engrossing. The Help – great story, great performances. It was one of the few films I’ve seen that depicted the fear to speak and/or act against white people so authentically. I truly enjoyed this movie. The characters were fantastic, at times funny, at other times heartbreaking, and often riveting. Hugo. I don’t know what it was about this film but I think those in the movie industry will enjoy this more than your average movie-goer and have a feeling that’s why it’s nominated. I wasn’t particularly interested in the story or characters or the turn it took about 3/4 of the way through once we found out who the toy shop owner really was. It was a tepid reaction for me. Midnight in Paris – I’m not usually a Woody Allen fan, I’m not usually an Owen Wilson fan. But I really enjoyed this movie and the concept of 1920s Paris come to life. I loved meeting the “real” F. Scott Fitzgerald, Ernest Hemingway, Dali, Picasso, and many more. Wilson did a pretty good job as the star struck struggling novelist; it was fun to watch Rachel McAdams as the mean girlfriend after so many roles as the beloved sweetie. Great film all around. Moneyball. Great sports movie about a true story – some solid performances, some inspirational moments, the big game-changing move that altered the face of baseball forever. Not quite sure it’s Oscar-worthy, but I enjoyed it throughout. If I had to pick a winner out of the ones I’ve seen to date, for me it’s a toss up between The Help and Midnight in Paris (believe it or not). The Help for the sum of its performances and Midnight in Paris for the complete escape the film allowed the viewer to partake in – it was magical. It’s that time again! Oscar season! They announced the nominations this week, which means my quest to view all nominated movies and performances is officially underway. The Golden Globes results usually give a good idea of who and what will be nominated for the Oscars so I got a head start but now that the Oscar list is up, time to roll up the sleeves and get rolling. Once it gets closer to the date, I’ll post my picks.